ALL4PACK Paris will be opening in less than a week and will run from 26 to 29 November at Paris Nord Villepinte. 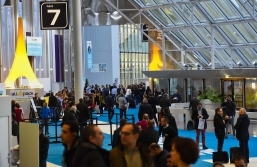 80,000 professionals from the packaging and intralogistics industry are expected to attend. In Hall 7, the ALL4PACK Startups Lab will showcase the most remarkable innovations. 16 start-ups will come together to unveil their innovations and perform their pitches. These four days will be packed with new products that can also be discovered on a multitude of videos. The premise of Glancy 3D is that looking is buying: we are primarily attracted to what we see! This start-up measures the visual attractiveness of your packaging, drawing on decades of research and its own artificial intelligence: an industry first! The company can thus offer you personalised design recommendations to optimise the pulling power of your future packaging. The European firm 3D Click has developed an agile prototyping and validation solution for packaging design which substantially reduces design time and accelerates time to market. The platform gives access to 360° collaboration in real time between designers and suppliers of packaging. Meanwhile, Packitoo, a start-up from the south of France, is reinvented packaging sourcing by linking up companies with the best manufacturers around the world. The system is straightforward: you post your brief and visuals on the company’s platform and it helps you find the best prices and suppliers anywhere in the world. Packitoo helps you to kick off the production and delivery of your packaging remotely. Innovation in packaging can also be found in materials, most notably with the new internationally patented bioplastic by the Spanish firm ADBiocomposites. Among the many new features of this compostable material: a high barrier to oxygen, offering better food conservation. Innovation can also be found in reissuing textures from the 1970s, such as the silver “spencer” showcased by the company Souvenirs du Futur. This material is flexible and robust, and has insulation properties to keep the heat or cold in or out, depending on needs. It is now available in more than 20 colours. Finally, discover eco-friendly and recyclable tote bags by L’indispensac, entirely designed from recycled fibre (offcuts from textile manufacturing and plastic bottles). Their production process reduces carbon emissions by a factor of 9 and enhances your environmental commitment in your communication initiatives or at your events. They are also labelled “Guaranteed French origin”. The French start-up LivingPackets has propelled the delivery of parcels or documents which have to arrive abroad as quickly as possible into a new dimension: that of the sharing economy. The firm uses our own personal journeys for the transportation of parcels using the start-up’s ‘packet’, a protective, connected, secured and geographically tracked shoulder bag. The delivery time is thereby reduced to purely the journey time, every person knows where the packet is at all times, and the ‘voyager’ is paid for their service. Result: a much faster and substantially cheaper service than that provided by traditional logistics players. And how about a 100% CSR solution for your parcel transport? The Lyon firm TheGreenFlux proposes to replace your disposable parcel packaging by reusable and connected containers. They are provided to you as and when you need them, you can track them throughout the journey, then they are collected by the company using a reverse logistics process. Working out of the European microtechnology hub in Besançon, MC Robotics develops a tool that will enable anyone to programme a robot. Its solution, Kactus, runs on Windows and does not require the user to enter any lines of code. Simply draw the robotic task that you wish to create on a simple and intuitive interface. You can even simulate your program in 3-D before deploying it on all types of robot and technical architecture. On the ALL4PACK Startups Lab, you can also discover the industrial air purifiers for offices, workshops or warehouses marketed by Obera. Indoor air is sometimes up to 10 times more polluted than outdoors, which is why filtering gaseous pollutants and dust has become a source of health and well-being for employees, ultimately resulting in savings for companies. A breath of fresh air, direct from Alsace! Also on the ALL4PACK Startups Lab, organised in association with NetMedia Events, you can discover the following start-ups: Do Eat, Harsoliya Exim Private Limited, inUse, Proglove, Usitab and Wing. The first press release on this subject can be found here.